The officiating criticism then escalated thanks to a surprising source; boxer Deontay Wilder, who appeared with Greg Gumbel to promote his upcoming fight on Showtime, but first talked about rooting for Auburn thanks to his connections to the state of Alabama (even if he grew up in Tuscaloosa, home of the University of Alabama), and then went off on the refs. 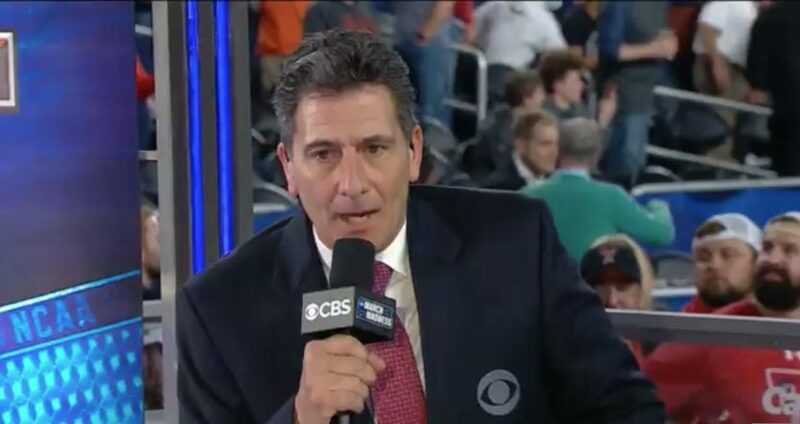 This also showed just how good of a decision it proved to be for CBS to use Steratore as a rules analyst for this tournament. He’s made some key contributions so far, and his past work as a NFL and NCAA ref seems to have made him quite comfortable talking to a large audience. He also seems to get what’s needed from a TV rules analyst; being quick, to the point, and definitive one way or the other. CBS brought him in last summer as both a NFL and NCAA rules analyst, and that move has paid off. Having a knowledgeable official who could clearly explain the rule in question here, and having him able to appear on set as well as just as a voice on the broadcast, made the on-air discussion of this missed call much better than it likely would have been otherwise.